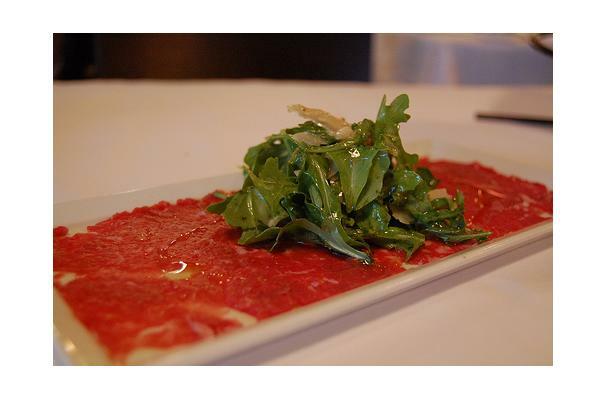 Carpaccio is a dish of raw beef, veal or tuna traditionally thinly sliced or pounded thin served as an appetizer. Carpaccio was invented at Harry's Bar in Venice, where it was first served to the countess Amalia Nani Mocenigo. in 1950 when she informed the bar's owner that her doctor had recommended she eat only raw meatIt consisted of thin slices of raw beef dressed with a mustard sauce. The dish was named Carpaccio by Giuseppe Cipriani, the bar's former owner, in reference to the Venetian painter Vittore Carpaccio, because the colours of the dish reminded him of paintings by Carpaccio. According to another story of the genesis of this famous dish, it was born at the Savini Restaurant in Galleria Vittorio Emanuele in Milan. A wealthy lady, who was an everyday customer, was indeed told by her doctor to eat only raw meat. Unfortunately, at the time, it was not socially acceptable that a lady of her status would order "raw meat" at the most elegant restaurant in the city. It was the waiter who suggested her to use a different name for it. Apparently a painting by Carpaccio was hanging on the wall at the Savini at the time, and the waiter suggested Carpaccio as the "code name" for the dish, so she would not be embarrassed when ordering it.